“The power of the spoken word” has traditionally been used to describe how great oratory can change the way people think. But with enhanced Dictation Commands in macOS, it also refers to dramatic changes in the way people work, learn, and how they access and create content. Using the assistive speech recognition capabilities of macOS you can dictate a letter, message, or perform command and control actions like launching and switching between apps, or finding and creating documents. But even more is possible when the built-in automation technologies of macOS are combined with its assistive architecture to create specialized voice-triggered commands. This website provides a free set of dictation commands targeting Photos, the iWork suite of applications, and the Finder to deliver productivity solutions that perform a variety of common tasks and procedures. We welcome your feedback and suggestions, and will be updating the collection often. Enjoy! (⬆ see above ) Dictation Commands in action. 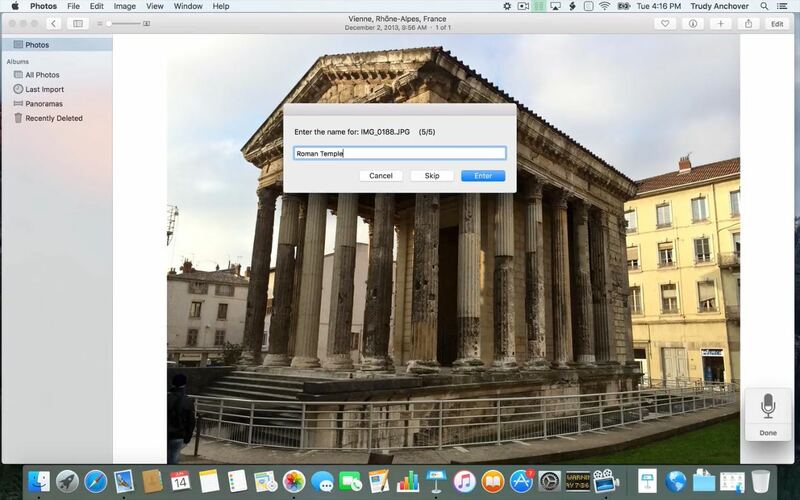 Building a Keynote presentation using Photos, Maps, and Numbers. Siri in macOS is based upon an entirely different set of technologies than Dictation Commands, and offers very different functionality and abilities. Your interactions with Siri in macOS are actually communications with Apple’s computers over the internet. That is why your computer must be connected to the internet in order for Siri to work. Generally, Siri functions as a virtual assistant performing secretarial duties, such as setting reminders, making appointments, looking up places, and gathering information from outside of your computer. Siri is very good at those type of tasks. However, Siri’s awareness and control of your actual computer environment is limited to rudimentary things like performing searches and opening folders. Dictation Commands are “local,” meaning that no internet connection or communication is required, everything you need for them to work is on your computer. 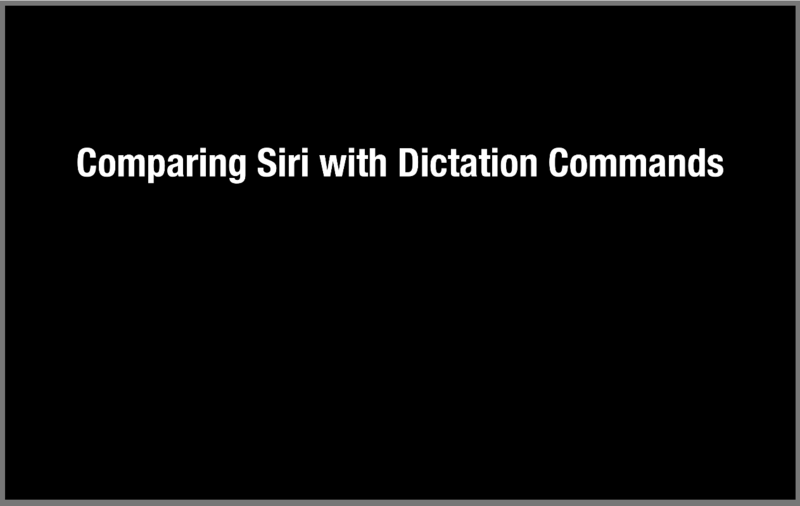 And unlike Siri, Dictation Commands “know” about your documents, files, windows, calendars, and the items you have selected, and can control the applications you use to assist you with the tasks you want to perform. Accessibility is about making it easier for all users to get the most out of the Mac. And the great news is that the native speech recognition and automation architectures of macOS (OS X) provide the means for delivering accessibility control of the OS and its applications by users who simply speak flexible phrases called Dictation Commands. This website is dedicated to providing all Mac users with the ability to use their voice to assist themselves in changing our world. Enjoy! Mention of third-party websites and products is for informational purposes only and constitutes neither an endorsement nor a recommendation. DICTATIONCOMMANDS.COM assumes no responsibility with regard to the selection, performance or use of information or products found at third-party websites. DICTATIONCOMMANDS.COM provides this only as a convenience to our users. DICTATIONCOMMANDS.COM has not tested the information found on these sites and makes no representations regarding its accuracy or reliability. There are risks inherent in the use of any information or products found on the Internet, and DICTATIONCOMMANDS.COM assumes no responsibility in this regard. Please understand that a third-party site is independent from DICTATIONCOMMANDS.COM and that DICTATIONCOMMANDS.COM has no control over the content on that website. Please contact the vendor for additional information.